Since childhood, we have heard the word Principal, and most of the times it brought fear or admiration depending upon how our school principal was! But here is another word ‘principle’ which sounds exactly the same, yet the meanings are wide apart. Such words are called homophones. Let us discuss these 2 words in this Grammar.com article. · Manhattan’s principal place is Times Square. · The principal reason for his dismissal is bad behaviour at workplace. Similarly, as a noun, Principal means someone of prime importance or the most important (or senior most) person in an organization. And, that’s why we call the head of a school/college as ‘Principal’! · Our Principal is a very knowledgeable person. · The principal of the college went for rounds every day. · A sketch of the principal suspect is ready. Principal also means the initial sum of money that is lent or invested in something, and on this amount, an interest is paid after maturity. For example, if you have deposited Rs100 in bank, that is the ‘principal’ amount. The total amount might increase after a time period but the principal amount remains the same. Principle is a noun meaning a truth, assumption or a law. You can live life on your own set of principles, i.e. you have certain rules and ethics that govern how you choose to live your life. · The principles that govern this office are strong and ethical. · Don’t let yourself be fooled by big money. Stick to your principles! · This experiment is based on the principle that air has its own weight. · The layout was approved in principle, but more work needs to be done for implementation. The difference is pretty straightforward, however while writing many users get confused about the spelling. If the basic meaning is ingrained in the mind, you can quickly think of the meaning and write correctly. Our school Principal is a highly principled man. He invested $20,000 in the bank as principal amount for school funds a decade back and now the amount has doubled. In the above sentence, ‘principled’ is the adjective form of ‘principle’ and indicates a person with high moral principles or ethics. "Principle vs. Principal." Grammar.com. STANDS4 LLC, 2019. Web. 22 Apr. 2019. 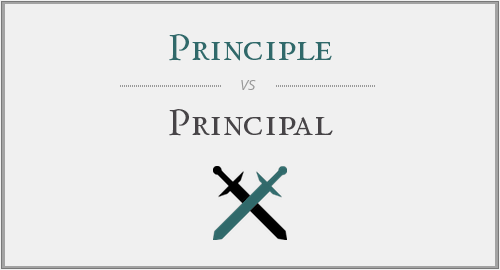 <https://www.grammar.com/principle_vs._principal>.